- WWE posted this video of R-Truth hunting for Nia Jax backstage after she stole his #30 spot in the Men's Royal Rumble match last night. Titus O'Neil tries to calm Truth down but Truth says Jax needs to apologize to everyone. 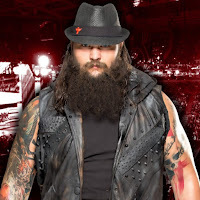 - Bray Wyatt is teasing his return to WWE on Twitter, as seen below. Wyatt responded to a Wyatt Family photo from Xavier Woods, which was posted after Rowan returned to help Daniel Bryan retain the WWE Title. Wyatt wrote, "Many have come to pry me open. Many have come asking for the key. Offering promises that the doubt would lessen, flaunting their oaths as currency." Wyatt also responded to a fan who said they missed seeing him in the Rumble. He wrote, "Near time." - Above is video of WWE Champion Daniel Bryan talking to Cathy Kelley after his win over AJ Styles at the Royal Rumble last night. Bryan said he felt great after the win as he was proved right again, about AJ and the fans being fickle. Bryan rants on the fans being fickle and said he's not out to impress people, make them cheer or boo, he's out there to change the world and use his platform to make the world a better place for the children. Bryan said AJ is just out to get cheers, but he wonders how AJ feels after failing again.